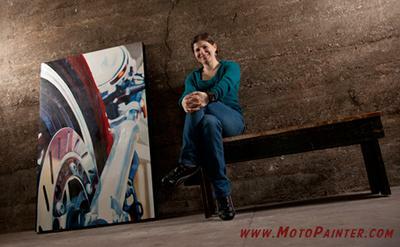 Guenevere Schwien is a talented oil painter whose subject has been motorcycles for nearly a decade. She is seeking to make her work available to the masses by having her painting printed on aluminum panels that appear to hover an inch off the wall. In order to accomplish her goal she is asking the motorcycle community for a little help. She has created a Kickstarter to raise funds for her initial metal print run as well as an opportunity to show her work at the Mid-America Motorcycle Auction in Las Vegas. Her budget is $6500 and it needs to be reached by December 3rd. In support of the project, she has created several brand new products as rewards to her supporters. Her Kickstarter is open now and time is ticking away so head over and support a rising Motorcycle Artist. Guenevere's work has received several honors including awards, a residency, and inclusion in the AMA Motorcycle Hall of Fame Museum's art of the motorcycle show. Her work was also in the Micheal Lichter Ton UP show at Sturgis 2013 and will be in the forth coming book. 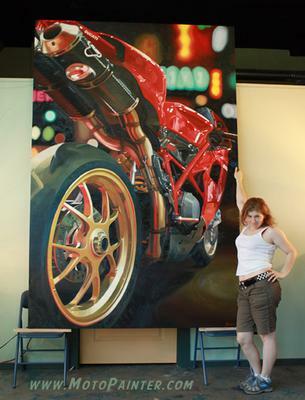 She has also been commission to do a 9ft tall Ducati 1098 oil painting, and her work is in collections across America. Guenevere rides a 1988 NT650 Honda Hawk and lives in Portland Or. Return to November 2013 Her-Motorcycle Forum CLOSED.